With my vacation slowly creeping up to me, i’ve let myself go. So, come on munchie food for later! 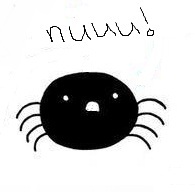 I opened the pantry to grab some crispy mini’s for later, sitting on the door i see a small spider.. raising its front legs at me, almost as a warning. Nuuuu! its a trap! Update: I think he was warning me not to close the door on him insted of me not getting a bigger waist line. hes now smooshed on the door. my bad. ~ by neonoirr on March 4, 2013. This entry was posted on March 4, 2013 at 8:09 pm and is filed under Uncategorized.You can follow any responses to this entry through the RSS 2.0 feed.You can leave a response, or trackback from your own site.